IMC Nigeria has organised CMC Certification Workshop, Membership & Fellowship Induction in Lagos – May 23, 2018 at De Edge Hotel, Plot 12, Location Road, off Tombia Extension, (by Mandela Car Wash), GRA, Phase III, Port Harcourt, Rivers State. 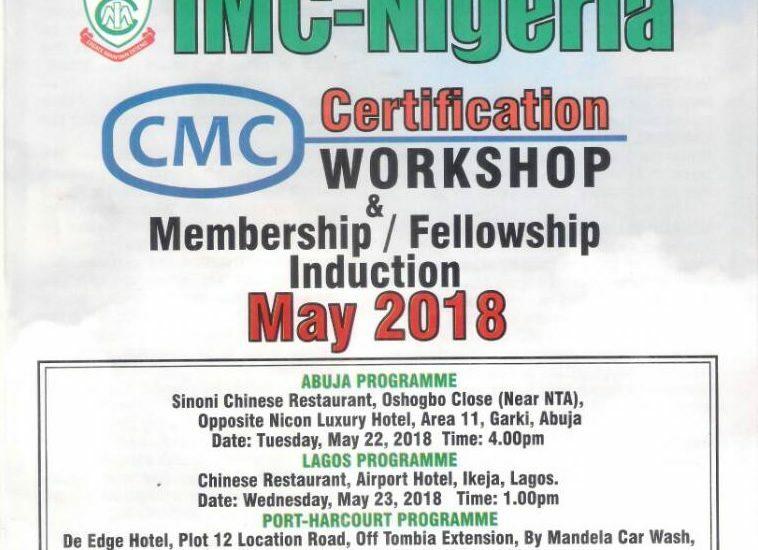 IMC Nigeria has organised CMC Certification Workshop, Membership & Fellowship Induction in Abuja – May 22, 2018 at Sinoni Chinese Restaurant, Abuja. IMC Nigeria has organised CMC Certification Workshop, Membership & Fellowship Induction in Lagos – May 23, 2018 at Lagos Chinese Restaurant, , Airport Hotel, Ikeja, Lagos.